They were most complicated speeches to deliver afloat, ones I had to learn. In the end the second part was heard OOV – out of vision. I could have read the lines. But then they wouldn’t have stayed in my head forever, as they have. The scene behind the camera that day on Derwentwater was rather different from from the scene in front of it. I’m pretty sure that the photographs below were taken this same day. Please let me know if the far bank is indeed Derwentwater or if I am mistaken and this was shot on Coniston. This shows the pontoon being used as a safety craft rather than a camera platform. Swallow is moored to it with Simon West, Suzanna Hamilton, Sophie Neville and Stephen Grendon onboard. Their chaperone Daphne Neville is standing-by with a track suit top as I was cold. First assistant David Bracknell is approaching in the Dory. I got cold sailing but it was a glorious sunny day with a fair wind. We achieved a huge amount even if Cedric fell in. As you can see, some of the boatmen and crew were wearing life jackets, others were not – including my mother. We wore BOAC life jackets for rehearsals but Swallow is a safe little boat – her keel ensuring we didn’t capsize if we happened to jibe and we never fell in. The pontoon was really rather more dangerous being a raft with no gunwale. Any one could have misjudged their step and plopped overboard. Luckily we were not stiffled by Health and Safety in those days – only the rigorous demands of movie insurance companies. 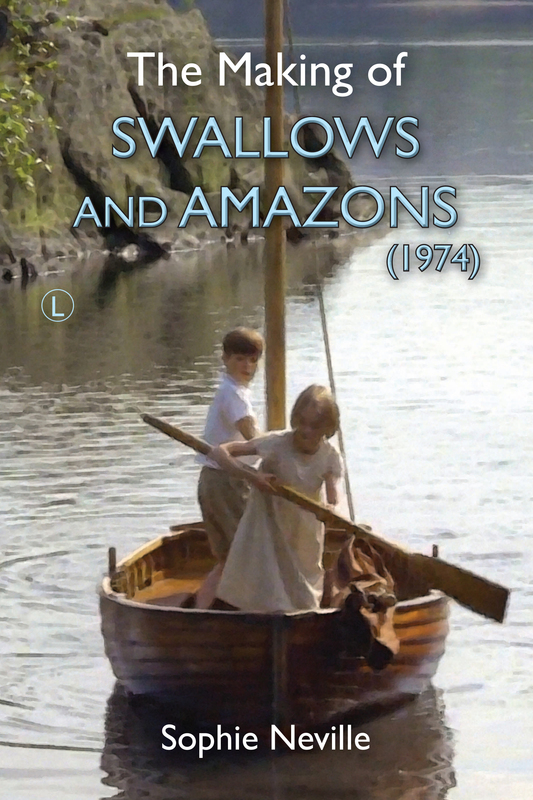 This shows the camera crew climbing aboard the pontoon in order to film Swallow sailing. Daphne Neville sits in the Dory safety boat in the foreground. A reflector board, wrapped camera mount and microphone are already on board. I’m sure we had already shot the first two scenes of the day when I was in Amazon, setting the anchor and later hearing the robbers. I expect Claude needed to re-shoot for technical reasons. Day-for-Night filming requires clear, sunny days and he would have needed still water. I have some of my father’s 16mm footage showing us at around this stage in the filming. It was shot on a different day but shows us on the shores of Derwentwater, waiting around before rushing off across the lake in motor boats to finish filming before Claude lost the light. You see the pontoon and a safety boat towing Swallow, me snapping bossily at Roger to get a move-on, (unforgiveable but I was 3 years older than him and irritated to distraction), the third assistant Gareth Tandy in blue with glasses, our sound recordist Robin Gregory throwing his arms wide open, Kit Seymour and Lesley Bennett by the lake shore, David Blagden with his short hair-cut splicing rope, me in my Harry Potter-ish blue nylon track-suit top with Albert Clarke the stills photographer, Swallow and some mallard duckings. We managed to film a lot on that day, didn’t we?! I have to say that I couldn’t actually see cormorants through the telescope. The shots of wildlife were added later.